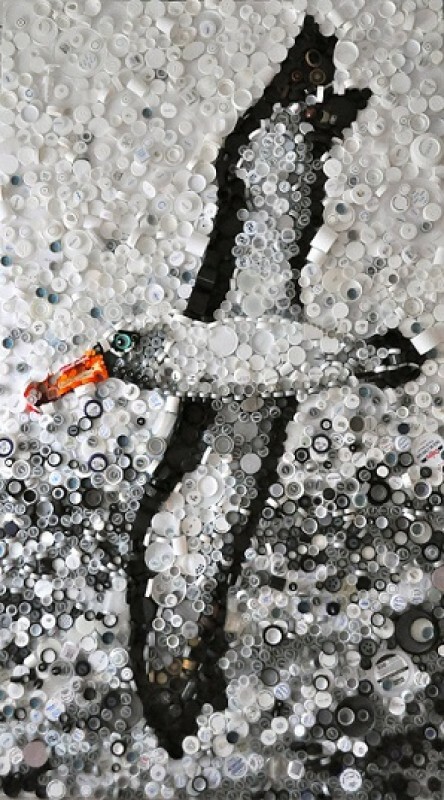 The Cameron Gallery is proud to present the art of Denise Hughes, whose work brings the problem of plastic in our oceans into sharp focus. 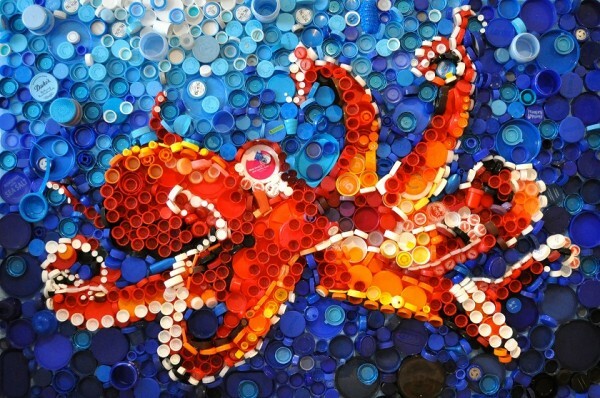 Hughes’ large-scale murals feature vibrantly colored maritime creatures created with plastic bottle caps. In the wild, sea creatures often mistake floating plastic caps for fish and either eat the caps themselves or feed them to their young. The plastic particles build up in the animals’ stomachs without providing nourishment. In Hughes’ work, the sea creatures’ forms are ironically composed of the same materials that contribute to their demise. Hughes uses her murals to educate the public about our overproduction and overconsumption of plastic. 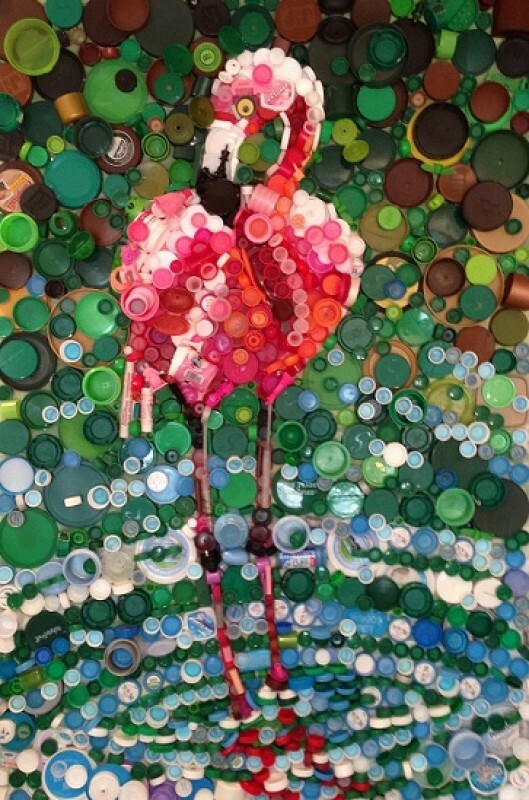 She urges community members to send bottle caps to her studio that she then uses in her murals. In this way, Hughes both draws attention to this problem as well as removes these products from the waste stream by repurposing them in art. Beauty from Toxicity runs from June 19-July 11. An opening reception will be held on Friday, June 19 from 6-9PM. The evening’s festivities include light snacks and drinks, as well as free art making in the Make and Take room. This event is free and the public is warmly welcomed. Third Friday at the Cameron Gallery is sponsored by the Durham Co-op Market and Sam’s Quik Shop. This Third Friday also celebrates the Artist Spotlight exhibit at The Scrap Exchange. Each month, The Scrap Exchange, in conjunction with local art therapist Martha Dyer, features the work of an artist whose art tells a story of healing, survival and creative self-expression. The work is displayed on movable walls located inside the center. Artists featured in the Artist Spotlight show receive 100% commission for sold work. This month’s exhibit features James Obie. The Cameron Gallery is located inside The Scrap Exchange creative reuse arts center at 2050 Chapel Hill Rd. in Durham. For more information, call The Scrap Exchange at 919-688-6960. Tagged art opening, Cameron Gallery, Scrap Exchange. « The Lakewood Flea Market is Here!